Elephants have long been part of Nepalese culture and tradition and play an important role in religious (mainly Hindu) beliefs. There is a long history of domestication, particularly related to religious use. Up until the 1960’s there was a large elephant population located in the lowland forest area of Nepal. However, rapidly rising human populations saw mass resettlement and land clearance which has had a devastating effect on elephant numbers. Wild elephants in Nepal are often migratory visitors from Bengal. Most of the wild populations are found in small heavily fragmented groups with little chance of being viable in the long term. However one glimmer of light is within the boundaries of the Royal Bardia National Park, where a significant population increase has been recorded rising from 25 elephants in the early 90’s to over 50 individuals a decade later. 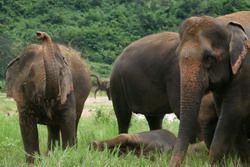 The Nepalese government has recognised the importance of elephant conservation and has established five protected reserves and an elephant breeding facility at Khorsor. 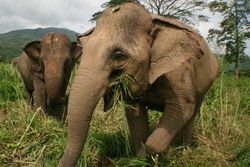 The number of domesticated elephants in Nepal had been steadily declining from the turn of the 20th century to the 1970s. However the last 25-30 years has seen an increase in numbers. This reverse of trend is partially due to the increasing availability of work in the growing eco tourist industry and also a conscious decision by the Nepalese authorities to use domesticated elephants to conserve the wild population. 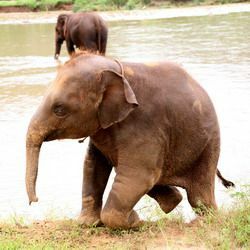 Most of the captive elephants are located in camps based around the National Parks and are used for tourist excursions. However, a small number are used to help with other conservation policies. Trained elephants were used to capture five wild rhinos that were translocated to create a viable family group and others have also been used in the forests to help count wild rhino and tiger. Although small in number, Nepal’s elephant population is stable and has long term viability. A forward thinking conservation policy and motivated officials will almost certainly contribute to the maintenance of numbers in the near and medium-term future.